I live with my husband of 26 years and our youngest daughter soon to be 18 ! Wow I don't know where that time has gone ! We have 3 children the other two have now flown the nest,we've also been blessed with 3 beautiful grandchildren. As parents we always doubt what we're doing in the choices we make for our children only you know what's best for them. We provide quality care working alongside you to love care and nurture your child. Our aim is to encourage confidence ,happiness,compassion and understanding within every child,ensuring their individual needs are met and supported within a fun family environment. Quote from my Ofsted report "The childminder has very good relationships with parents,they confirm they find the childminding service "excellent". Parents are very happy with the childminders care of their children and her "fantastic work " providing a loving home from home setting. We enjoy activities such as arts & crafts,messy and sensory play with sand and mud ! To encourage social play we attend play groups,rhyme time,soft play area. 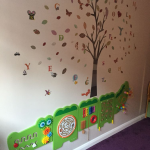 We have a purpose built summer house where the children have lots of fun choosing from a wide range of toys and learning activities ,where they can develop there learning skills with independence with lots of choices such as dress up,cars,train set,building blocks puzzles,books dolls and much more. This offers a really relaxing space, encouraging free flow play into the garden,where they search for treasure on the pirate ship . All aspects of Early Years Foundation Stage are covered within all activities. Thank you for taking the time to look at my profile and reviews. please feel free to contact me for further information or to arrange a visit. Below are the latest reviews for Charlotte. Please note that reviews represent the subjective opinions of other Childcare.co.uk users and not of Childcare.co.uk. Parents must carry out their own checks and references on childcare providers to ensure that they are completely happy before enaging in the use of their services. Charlotte had our little girl from 11 months to 3 years old. Charlotte always showed great affection towards her which gave real confidence that she really cares. Charlotte's very good with keeping the children entertained and making learning fun. It was very common to pick our daughter up with her having made something or shouting about something exciting she's played (and learnt from). They often went on outings to playgrounds, parks, activity centers and even a day in the Isle of White. I would absolutely recommend Charlotte. We couldn’t have coped without Charlotte. Our Son has been with Charlotte since he was 11 months old, she was recommended through a friend and it’s by far the best recommendation I’ve ever had. Both myself and my husband are in the military so our lives can be hectic, with things changing on a weekly basis. Charlotte has been extremely understanding and has not only helped my son feel settled and happy at her home but also been supportive when he’s not quite understood why mummy or daddy haven’t been at home for a while due to work. Charlotte has a great connection with all the children she cares for and you can see just how much my son adores her by the smile he greets her with every morning. She is professional, loving and also implements fair discipline when required. My biggest fear after having my son was leaving him to go back to work but Charlotte has made that transition so much easier. I know he is safe, settled and having essential interactions with other children as well as been given the best care and love within her home. I’ve met all of her children, grandchildren and her husband who are all extremely loving and welcoming, not forgetting her adorable pets. My only regret is that I can’t take Charlotte and her family with us to our next military posting. They will all be greatly missed. I would highly recommend Charlotte and Michaela as childminders. Charlotte has been a fantastic childminder to our daughter and we feel very lucky to have been introduced to her when our daughter was still a baby. From day 1, Charlotte demonstrated her expertise in professional childcare. She organises activities that are adjusted to our daughter’s age and current skills. She monitors our daughter’s development and encourages her to practise newly learnt skills as well as gradually introduces those from the next development stage. Charlotte supported our daughter at all the important stages of her development, when she started walking, during the weaning, potty training, as well as later in her pre-school age as she is starting to read and write. The setting has been appropriately adjusted to each stage. Charlotte encourages learning via a variety of games, songs, readings, or indoor and outdoor play activities. Our daughter absolutely loves the summer house as well as all the play area in the garden. Our daughter is bi-lingual and so it was great to see when Charlotte created a long list of flash cards and helped our daughter say the words in the second language. While taking care of our child’s cognitive development, most importantly, Charlotte creates an environment in her house where our daughter feels happy and safe. For us as parents this is our top priority and to know that our daughter is given such care puts our mind at rest while we're busy at work. Charlotte and our daughter have gotten to know each other well and I notice a lovely bond that grew between them. Lastly, all the family members at Charlotte house including the lovely animals have become our daughter’s friends. She knows them all by name and when we're at home she tells me what everyone was up to and how they spent their days. It's nice and reassuring to see our daughter feels at home with Charlotte's family which I think contributes even more to creating a positive and safe environment in which she can continue to grow emotionally, as well as intellectually. I completely recommend Charlotte. Charlotte looked after my 15 month old daughter 2 days a week due to the nursery she attended couldn’t accommodate her fulltime. I was worried that Evie would take time to adjust to going to a new environment but straight away Charlotte made her feel comfortable and it was like Evie had always been there. Evie’s confidence grew each week while she was with Charlotte, and she would pretty much just waved goodbye as she ran inside without looking back. Evie enjoyed lots of time outside whether it was in the garden, the park or the summer house where there were loads more toys. Charlotte kept a diary of each day Evie was with her and discussed what adventures they had been on and any new developments, following the early years foundation stage (EYFS) system. Charlotte looked after my son full time from the age of one until he went to school last year. I was extremely happy with the care Jack received, and the great progress he made whilst in Charlotte's care. Charlotte's home was always welcoming, clean and well organised and Jack had great fun playing with all the toys available and with the other children in her care. Beyond all this though, it was Charlotte's warm and friendly but no nonsense approach which set her apart from other childminders we have experienced. She provided a wide, fun range of activities including plenty of outdoor exercise. I know that Jack enjoyed drawing and sticking, reading and puzzles as well as outings to the park and playgroups, trips to feed the ducks and walks in the woods. Charlotte is a great communicator and had no trouble in gaining Jack's confidence and therefore encouraged good behaviour and kindness and compassion to others, both skills which are important to us at home. When Jack stepped outside his boundaries she responded with firm but kind discipline explaining what we would like to see in terms which he understood. When he was hurt or feeling under the weather I know that he felt happy to be comforted by her. Charlotte completed a diary detailing what Jack had done each day. From this I had a complete picture of his whole day including what he had eaten and all his activities. This helped me to feel involved with his care and helped me to be able to talk to him about his day. All in all I am thoroughly happy with the level of care Jack received and Iâ€™m certain that being in such a positive and happy environment has helped him develop into a confident and self assured boy. I would absolutely recommend Charlotte as a great and reliable childminder.